A common problem is that you may have tried to change your Email Notifications to have them sent to a different email address, but when you test it you find out that it has only gone to your old email. Here is a simple guide to help educate you on how to do this properly and fix it. The above-mentioned problem mainly happens because you are using the "Test Email" button, which by default is configured to send the email to the email address that is associated with your account and found under your Account > Profile. So why does this happen when using the Test Email button you ask? 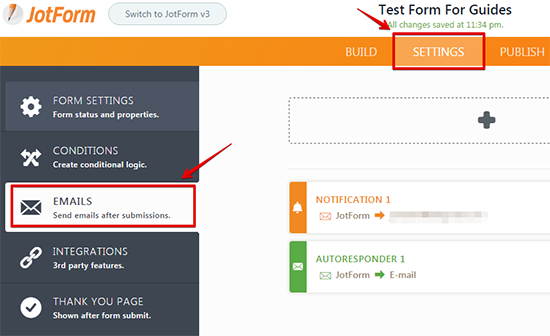 When you first create a JotForm account you are entering in your Email Address. 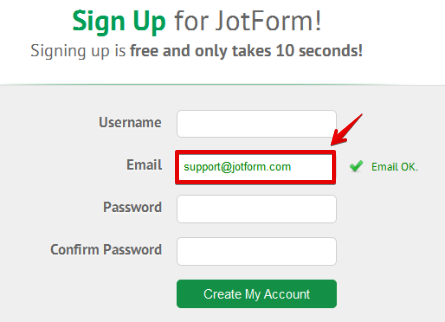 That email address you signed up with is what is used for your JotForm Account Profile. This is the same email address that is always pre-populated into any new form that you create here. 1. In My Forms, select the form and then click the "Edit Form" button. 2. In the Form Builder, go to the "Emails" section. Click the "Settings" button in the top menu. After that, go to the "Emails" section. 3. Hover the notification and then click the "Edit" icon. 4. Navigate to the "Recipients" tab, you'll see the "Recipient Emails" there. You can edit, delete or add a new one there. 5. Click the "Save" button in the main form builder to save all the changes made. 6. Finally, all you have to do is preview your form, fill it out, and click the submit button. You should now notice your notifications arriving at the new email address you have specified. If you have any questions or if the emails are still not being sent to the right address, do leave a comment and we would be happy to assist you with your issue and help you get the right email to the right inbox. I have one of our forms going directly to a 3rd party service desk program we use for work orders. 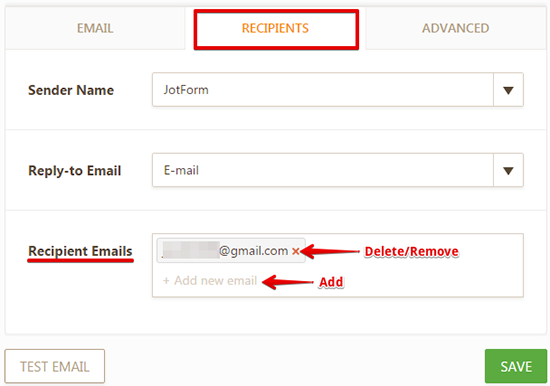 Once the form is received in our service desk the requester's email is always the administrators email address for JotForm. Is there a way we can have the requester's email address sow up instead of the administrators? I just want to say I love your website and it has made it very easy for our school registrations. I am wondering however, Is it necessary that I have this notification of emails on? Sometimes I am receiving 13 notifications in my inbox and I don't know if I need to do this now. I can change the email address to our group one but I am waiting on confirmation from our IT guys. Or can I simply delete my email and not have them sent to my emails but rather check my submissions in the Submissions link. I have went through this and I'm not getting a notification when someone click the submit button. The infor is being saved which is good but I need to respond to the new submissions right away so I need to know when they come in. How do I fix this? Our group email address was deleted once we switched email services. We noticed that we no longer received the automatic notice that a form was submitted. In addiiton, the other individual email addresses also didn't receive the notice. We went ahead and deleted the group email address and added the missing individual email addresses on our forms. QUESTION: Does a bad email address affect the automatic email sent by Jot Form or is that a technical "glitch?" I ha three email response address set up I deleted one and now when I try to recreate an additional one I get an error : To use multiple notification emails, please upgrade your account. how many can you have for a free account? I need the notification email with the completed form info to go to an email that is selected in one of the form fields. in some of my email notification set-ups, it allows me to select a field from a drop-down list, but in this one it doesn't. Can I make it give me a drop-down list of fields instead of just choosing one email to send it to? I'm having issues with all of my fields not showing when I preview the form. I also the form and my information will not erase. How do i fix this. I am using Jotform for a while now. The email notification works or worked well for a couple of forms. My name is Sarah Simmons and I used to work at Road and Bridge. I'm still receiving work notifications. I need to be removed from the list. Hello, we have followed the steps but the test emails are still sent to the account email rather than the new added recipient emails. I would appreciate your help as this is fairly time sensitive. Have followed all the steps above but we are still not getting emails to the two additional emails that were added. Would like your assistance before I contact our IT again. I have completed all steps but still cannot get submissions to go to the email provided under settings. This still doesn't seem to be working :(. I need our job center satisfaction surveys to be redirected to my email address rather than the former person in my position, hhenry@worksourcemontgomery.com (this email has been redirected to CEO). I looked up how to add email addresses and how to change...but since I didn't open the account, I don't have a login or profile. I could create a new account but it needs to be linked to the current account bc our survey is fine as is. Please advise on how the switch can be made. Thank you! If I change the email address, do I then need to update the code and re enter that on my wordpress website? This is not working for me. I keep getting the emails to my account address. Hi, when I submit an example form to test the emails listed as recipients, the only email that receives the submission is the email i created the account with. The generic email I created to accept the forms so that they wouldn't come to my personal email isn't receiving the submissions. The email I want to receive is, eventsst@gmu.edu. Thank you! recipient not getting email notification, how to? Can you please, please, please check treasurer@bargarafc.org.au? Is it possible to have the recipient email address be more than one email address? I need it to go to 3 different addresses. Will it do that? If so, separate by commas or semi-colons? I do not wish to change the email associated with our account, however, we received a message from a client who has reported a strange email response to her recent order. The email she received from us simply said, "undefined." It appears that there is a glitch in the automatic email reply system. How can I test this without actually making a purchase? Better yet, how can I fix it if there is, indeed, a glitch? Does the notification need to be setup before the form is developed? I am following all the steps in the explanation for a form I developed on Tuesday but the email keeps defaulting to the profile contact and not the email I want the notification to go to. Hi I followed the steps mentioned above, but even if the email appears correctly it doesn't work. Love the fact that the sequence number appears in the notification email. But would rather see that number at the start of the email, or in the subject line... Thanks. But- can anyone enlighten me as to what a " Bounce List " applies to on a users Profile > Settings page? I tried this exactly step by step and it does not work. Keeps sending to the default email no matter how many times I change it. Please advise. Thank you. I am trying to update our old form but with my new form I can't seem to be able to send emails to our Acquisitions email account: LibraryAcq@gmit.ie - it works fine with my own account but when I try and veryify the other email address the code does not come through, just some html, which doesn't work. The old version of the form, which is live on our website works fine. Please Help! Am unable to receive Notification Emails on default Email Address nor the new Email! Test Email keep delivering to the Default Email Address, but I have never received Notification Emails when filled Form directly on my Website or via the Preview link! same here...i set two notifications on different emails but only the first (profile) works. something is definitely wrong there! I did all the steps and still not working... help! How do I receive notify on email message that I send with my email account without copy? How do iknow when I receive a mail and how do I check it on my gmail account. I have changed the recipient email as shown above, the new recipient receives the email but so does the default account email, they both do. Need to turn the default off, any suggestions? How to Change the Email Address Used for Notification Email? SMTP Sender: Ability to test the sender once SMTP settings have been entered. How do I change the email address to which the form is sent . How is this done please - ?